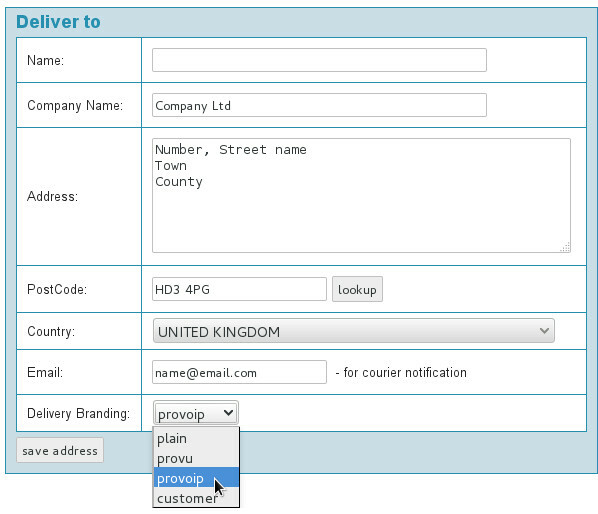 Did you know you can add a personal touch to your customers’ orders even when they’re drop shipped directly from ProVu? Simply select the service you require and we’ll take care of the rest for you. We can ship items direct to your customers with your own branded despatch notes, this service is quick and simple to set up and best of all, it’s available for FREE! Got a promotion or message you’d like to share with your customers? 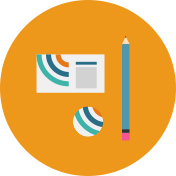 For just 30p per insert we can include a copy of your latest marketing flyers, stickers, or gifts in any of your parcels. Why not personalise your hardware? 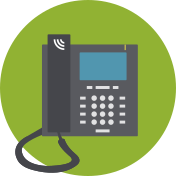 We can arrange for items such as phones and routers to be printed with your logo, helping to strengthen your brand. Get in touch to find out more. We’re here to help you and make your processes as easy as possible. If there is a service that you would like us to assist you with, please let us know and we will see how we may be able to help you. With Christmas quickly approaching, we would like to share our shipping and opening times over the festive season. Please note: The last date for shipping before Christmas will be Thursday 21st December. APC will not be operating between Christmas and New Year, orders placed to be collected by APC after the 21st December will not be delivered until 3rd January. 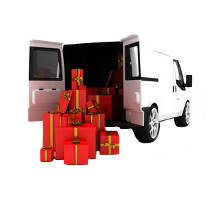 *Saturday delivery can be arranged for 30th December upon request, however this service will incur an additional charge. **Please note: We will be operating a ‘best endeavour’ service and collection times may differ. New Lower APC Shipping Prices! ProVu customers can now enjoy a new lower shipping charge for APC mainland UK deliveries. Here’s a brief overview of how shipping rates are calculated and an introduction our new pricing, starting from just £4.95! APC shipping prices are calculated on the size and weight of a consignment. They have two standard sized mailing bags which are referred to as ‘Mail Pack’ and ‘Courier Pack’ – if the despatched items can fit, and weigh under the bag limit they are shipped on this service for which we have some new discounted rates. As you can see in the above table, shipping charges are 50p lower for orders placed through our reseller portal, ProSys. Register for a free ProSys account today to start saving on APC’s next day services. We have doubled our warehouse capacity! We have recently completed building works on a new lift to help ease the process of bringing pallets into our warehouse. Our most recent development has opened up our cellar as usable warehouse space; more than doubling our capacity! 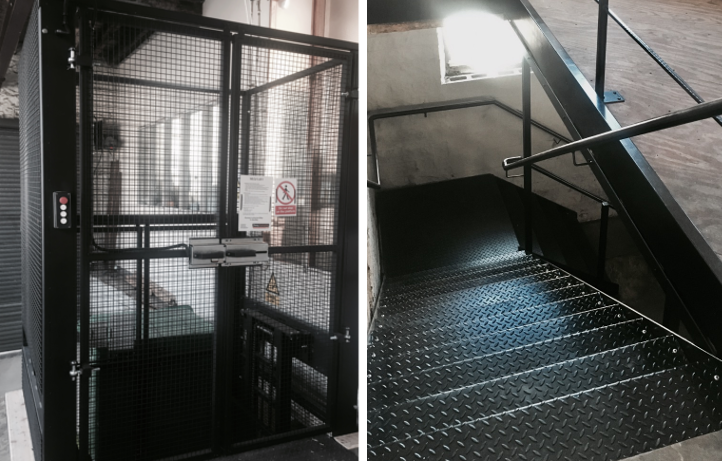 The new lift works on three levels – at loading level, up to our main warehouse level and down into the cellar. This work has allowed us to more than double the amount of usable warehouse space, giving us the ability to hold even more stock. Along with the new lift we’ve also built a new stairwell, the stairwell is now wider and less steep which will allow easier and safer access to the different floors. The expansion into our cellar is a natural step for us as our sales are increasing year on year, the expansion will allow us to hold increased levels of stock and to meet the increasing demand from our resellers. *Saturday delivery can be arranged for Christmas Eve and New Years Eve upon request, however this service will incur an additional charge. * If you place an order on the 23rd December it will be delivered on the 5th January, should you require the goods to be delivered on Christmas Eve, a £25 surcharge will apply. You will need to let us know if you would like this service. Did you know that we offer a free branded shipping service? This service is quick and simple to set up and it enables you to maintain a personal approach with your customers. Here is an example of how your despatch notes could look. We also understand that some of our resellers regularly ship products on behalf of their partners. We therefore offer you the ability to save multiple letterheads to your account. You can simply select the chosen letterhead for the specified order within ProSys. However, we also know there are occasions when plain documents are better suited, this option will remain available. To set up your branded shipping simply send us your letterhead as a PDF document to contact@provu.co.uk and we will take care of the rest. 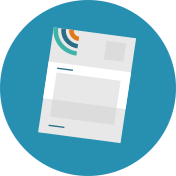 Check out our template guide to make sure your letterhead will fit well on to the despatch note we print. If you don’t have a letterhead, don’t worry, you can send us your company logo and address and we will create a basic template for you. On the order page select to add a dropship address. At the bottom of the ‘deliver to box’ you can then select your branding option for this order. And it’s as simple as that. If you have any questions about our branded shipping service please contact our sales team on 01484 840048. Today we have updated the order form in prosys for our trade customers. We now have some more flexible shipping options. There are 2 main changes. Ireland, Northern Ireland, Scottish Highlands and Islands, Channel Islands, Isle of Man and Isle of Wight. The order form will now correctly price shipments to all of the above destinations on APC, DPD and Parcelforce. If you have a larger consignment going to these destinations, then it is worth giving our sales office call to check if we can get a better quote. We now offer DPD as an alternative shipping option. We have used APC as our primary UK courier for many years. They offer a really good service and good systems integration. But we had some customers who wanted an alternative option. – Competitive prices to Ireland, Northern Ireland, Scotland and Isle of Man on a 2 day service. – More detailed online tracking. 1) Cut off for DPD is 3pm. APC is 5pm. 2) DPD not so price competitive on larger shipments. Despatches and deliveries will not be made on these days. APC can deliver on Saturday mornings over the bank holiday weekends, this can be done on request prior to despatch and will be charged at the standard Saturday delivery surcharge see our Saturday delivery prices. Royal Mail and other courier services estimated delivery times will also be affected.